I'm also writing about the period between the wars (again) and so it felt good to immerse myself in a book of this time. There are so many books out there about world war two, but when it comes to fiction, I've not read a lot that grabbed me about world war one, aside from a short story about Colette's cat which I found in the collection Only the Animals by Ceridwen Dovey. The Steady Running of the Hour is the story of Tristan, a Californian man who upon graduating college, in the interim when he's trying to decide what to do next, gets a phone call from a law firm in London who say they represent a considerable trust and there is new evidence that Tristan might in fact be the heir to this money. 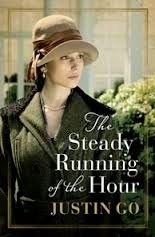 The catch is, he has to find something to prove that his great grandmother was not Eleanor Grafton, but in fact her sister, Imogen Soames-Andersson, who went missing in 1916. Tristan is intrigued and so he heads to London and begins a historical treasure hunt of sorts, following a trail of letters between Imogen and Ashley, the man who has left her the money. Interspersed with the tale of Tristan's hunt is the story of Imogen and Ashley themselves. They meet in 1916 at a lecture about alpinism, the practice of mountain climbing, in which Ashley is interested. Imogen simply loves knowledge. Immediately they are attracted to one another, but Ashley leaves for France in six days (there is a war going on after all). They conspire to spend the days together, and realise that they have a deep connection that is something like love. On the last night, they sleep together. Ashley leaves for France and is injured, but the army reports him dead. Imogen is distraught, and when the error is corrected, she heads to France to find him and tell him that she is carrying his child. She begs him to leave the army, to desert, and when he refuses, she disappears. When Ashley is killed attempting to reach the summit of Mt Everest in 1924, Imogen does not come forward to collect the trust. What happens in between? What becomes of the child? Is Imogen Tristan's great-grandmother? You'll have to read it and find out. It was hard to get into this book at first, because Tristan is a fairly apathetic guy, in that he doesn't think he really cares about anything. It's hard to follow a character with no drive or motivation. It's not until really the middle of the book that he clarifies he's not doing it for the money but for the mystery, but his push to reach the deadline before the trust passes in to be donated to charity does indicate that he thinks having that money might be nice. Tristan seems to care a lot about history but there is little mention of what he has studied. Nor does his quest lead him to a decision about what he might like to do with his future, although it does push him outside his comfort zone as he travels across Europe, meeting strangers, partying and poring over records. He seems to have prodigious luck with convincing archivists to let him look at material, but you have to forgive the book this anachronism because who would want to read about someone who is not allowed to look at archives?? In terms of plotting, I would have to say the book is extremely well done. Go is a master of leaving a chapter just at the point where the reader thinks they will discover something important, making this large book quite a fast read because it's so hard to put down! The war scenes are impeccable (a warning... don't read about the trenches whilst eating!) and on the whole, the story of Ashley and Imogen is far more interesting than Tristan's story. That is usually the case with this kind of book though. I really connected with this novel, because it achieved a lot of the things I have been trying to do with my own book. It also made me think about historical documents and the ways we leave our mark on the world now. Sixty years from now, will anyone be trying to piece together my life using the documents I leave behind? I should probably try to write in my journal more often if so! Small nitpick, but I was really put off by the choice to use dashes to denote speech rather than quotation marks. It looked sloppy and interrupted the flow for me. That's a method that lends itself to a slower, more capital L literary read, if you have to use it at all.